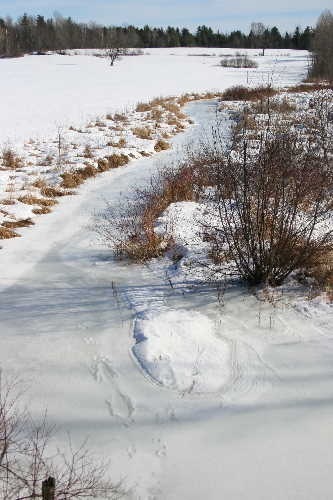 A couple of weeks ago I noticed these trails out on the ice of the creek the rail trail crosses. It looked like the animals had traveled down the frozen stream on a mild day, or perhaps just after a rain, when the snow that had been sitting on top of the ice had softened just enough to create slushy conditions. The temperature must have dropped shortly after because the prints, while not detailed, were certainly well-defined. The tracks belong to otters, of course. I say “of course”, but I actually wouldn’t have known this prior to moving to the lake house a few years ago. Then, we discovered a set of similar tracks out on the ice of the lake, and I’d hypothesized that it was a predator periodically dragging a heavy prey. Which still seems like a reasonable guess, but the real answer is obvious, now that I know it. The long troughs are from the animals sliding on their bellies. They’ll bound for several strides and then flop down, letting their momentum and the slippery ice carry them forward. This helps conserve energy – and during winter, every little bit counts – but is also probably just darn fun. As animals go, otters must be among the most playful. I’ve actually seen otters in this creek before, so I’m not too surprised to see their tracks here, but I tend to forget they’re around. I encounter them much less frequently here than I do down in the Frontenacs where Dan and I do our summer bird programs. The Atlas of the Mammals of Ontario, a project undertaken by Ontario Nature and published in 1994 (back when they were still known as the Federation of Ontario Naturalists), provides range maps for all of Ontario’s mammals. The larger species are typically more well-documented than the smaller ones (rodents, bats) simply because they’re easier to find and identify. All of the maps are available at Ontario Nature’s website. I’ve included here the range map for River Otter, as documented up through the early 1990s. White squares indicate areas where the precise location the record is from (mostly historical and/or OMNR trapline data) can’t be pinpointed. Coloured squares are known. The data used was taken across most of the last century, when available, with date indicated by shape. 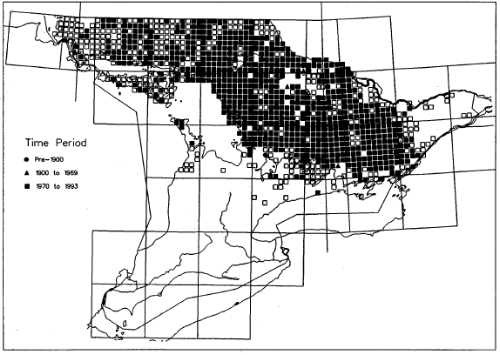 It’s pretty clear that the otter shows a close correlation to the Canadian Shield, rarely found in the limestone regions of most of southern Ontario. This is probably partly due to the fact that water bodies become scarcer in regions with the more porous limestone bedrock, but also likely has something to do with human land use. We’ve modified the vast majority of Ontario south of the Shield, to either urban or agricultural landscapes, with all the loss of habitat and pollution that comes with both. The Shield itself is too rocky, with too shallow a soil base, to make for good farming, so it’s largely been abandoned to nature in the last several decades. Where we live still sees a fair bit of agriculture, but it’s all mostly low-impact – small-scale livestock and hay farms. In the Frontenacs, even that scale of farming becomes scarce, and the primary use of land is simply residential and recreational – homes and cottages. I was so delighted when I discovered, via a neighbour at the lake, that there were otters in the area. And then when I found the tracks – and later, saw the animals themselves – I was over the moon. Otters! How cool! I’d always thought it funny that I’d never seen them where I grew up, and had kind of figured it was just because where I lived there weren’t any decent-sized water bodies. But looking at the map, now, I guess they weren’t in the area at all. Even if all I’m seeing are the tracks, it’s nice to know they’re here. 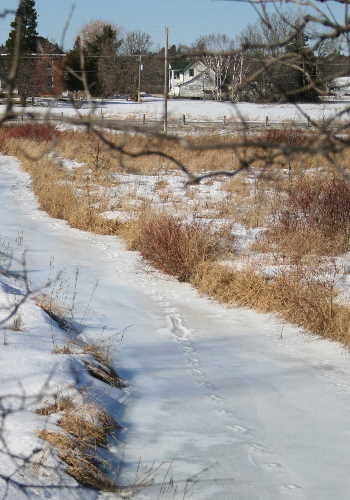 I need to remember to watch for this belly-slide pattern – we have otters on a similar creek on the property where I work, but we also have mink, fishers, etc. and to me it’s still challenging to tell the tracks of one large mustelid from another. Thanks for the photos! It’s nice to have those extra clues, Rebecca. I find tracks from animals in the same family hard to distinguish, too. So much fun to read your interesting posts. Thanks! While I live in Pennsylvania, I don’t think our local habitat is all that much different than yours. Haven’t seen any otters around here, but we have fishers, bobcats, coyotes, and plenty of other interesting creatures. Sounds like you’ve got a great selection of wildlife there! We supposedly have fishers, though I’ve never seen one here, but bobcats prefer the rockier, more extensively forested habitat of the Shield just west of us. Next Next post: The moth guide has arrived!